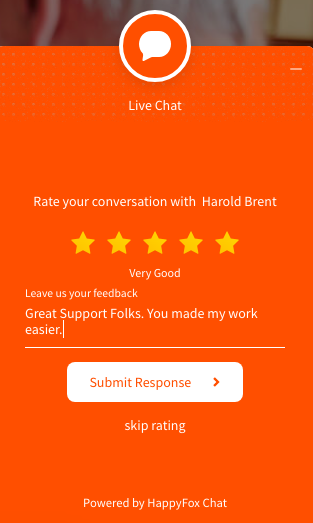 Chat Rating feature allows your customers to rate the chat conversation with the agent and leave a feedback. This feature is available on Mighty and above plans. Know if your customers are satisfied with your chat support. Analyze feedback/suggestions from your customers. 2. Go to Manage → Appearance. 3. 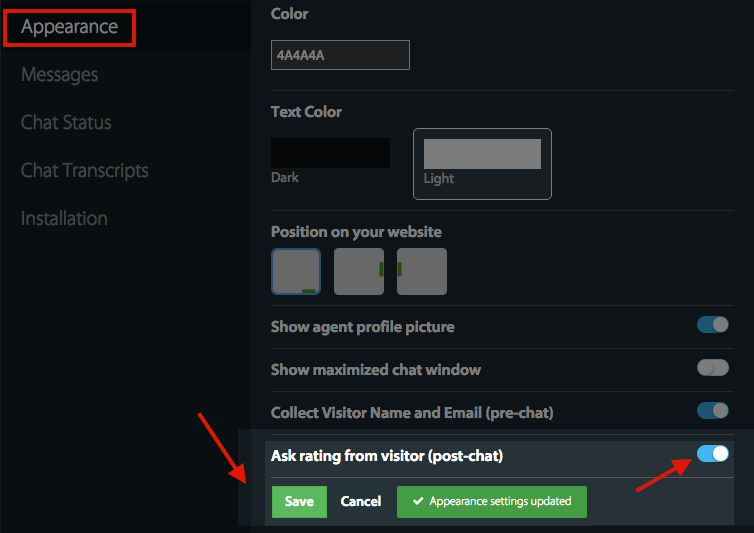 Toggle ON the “Ask rating from visitor (post-chat)” option → click “Save” button. How ratings & feedback are collected from Customers? 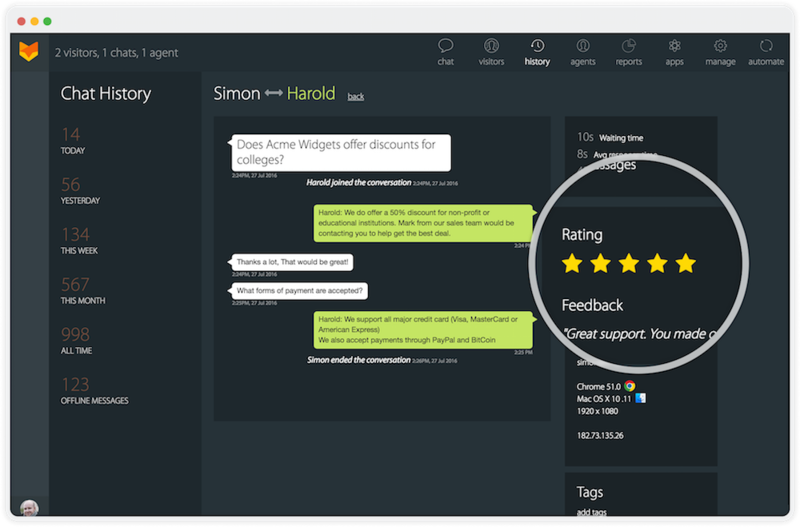 The customers can rate the chat conversation, by choosing the star rating on a scale of 1 to 5.
b) Give feedback/suggestions in a text box. On clicking the “Submit Response” button, the rating and feedback from the visitor will get submitted to the system. Note: Customers can prefer to skip rating the chat conversation. 1. In the “Chat History” tab, on the right-side pane of inside each chat transcript, the rating and the feedback provided by the visitor will be displayed. 2. Under "Agents" section, click on any agent’s profile and their overall Average Rating will be displayed. The rating can be viewed by all other Agent(s)/Admin(s). 3. 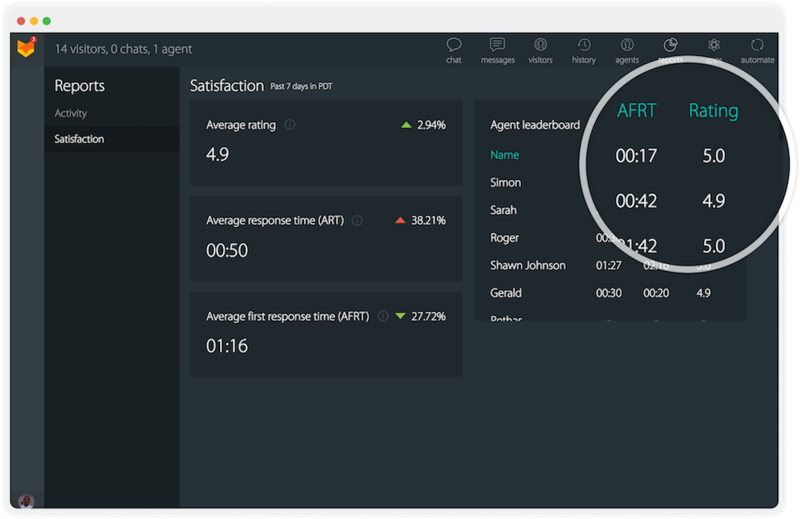 Under Reports, Customer Satisfaction section you can see the overall average rating for all the support agents as well as individual ratings under Agent Leader board. How chat rating works for a transferred chat? In the case of transferred chat, the rating for the chat conversation will be split amongst the agents who handled the chat. Say a customer's chat is transferred from Agent X to Agent Y. 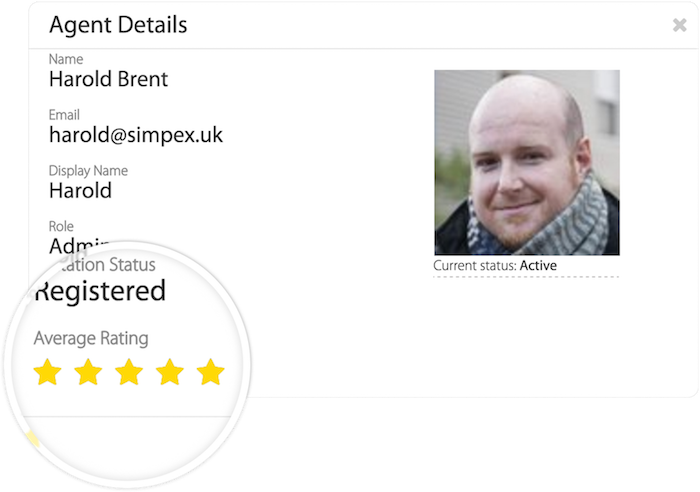 After the chat ends, if the customer gives a 4-star rating, both agents X and Y will get 4-star ratings.